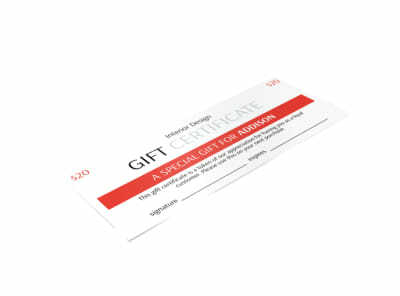 Increase sales of your creative services and products by offering gift certificates you design yourself using our creative gift certificate templates. Whether your creative endeavor is a tattoo shop, dance studio, web design firm, or something altogether different, sales of gift certificates translates to a plumper bottom line for you and increased brand recognition for your business. Use our online editor to add your own text, photos, graphics, and more, and then print your design from any location for instant access to gift certificates for immediate sales. We also offer printing of your certificates on premium paper using high-quality inks, saving you time and giving your printables a professional look.